Today at the grocery store, I witnessed an incredible mom. This creative momma had three kids with her ranging in age from about 5 years to 9 years old. Each child had a mini clipboard with part of the grocery list clipped to it as well as their own mini grocery cart from the store. While waiting at the deli, their conversations were about where to find their grocery store items. It would seem that there was nothing particularly extraordinary about the situation, other than the fantastically prepared lists this mother had taken the time to create as well as the three grocery carts that she had chosen to navigate through the store. I complimented the mom. “You are a fantastic mom! What a thoughtful way to make shopping fun for your kids. I am impressed that you took the time to divide up the list between them. That is amazing. Way to go!” And I meant it! She tried to blow it off a little, as compliments often make people uncomfortable. I get that. But this woman needed to be told how impressive her efforts at parenting were to me. But it is also clear to me that sometimes we do damage by offering this compliment in a way that reinforces the belief that our “good” parenting is measured by our “good” children. What if her children were whining and banging carts? What if one of them had thrown his list on the ground and refused to help? Would her efforts have been any less awesome? I don’t think so. I think she would have deserved my compliment regardless of her kids’ behavior. After all, HER efforts at parents were impressive. She put in extra effort on this particular morning to make grocery shopping a family task with her kids. Thankfully for her, the effort paid off in a grocery store trip that was going well. But even if it didn’t. Even if the munchkins with her were having a rough day, whining and arguing, her efforts would still give me pause to recognize her as a wonderful, creative mom. 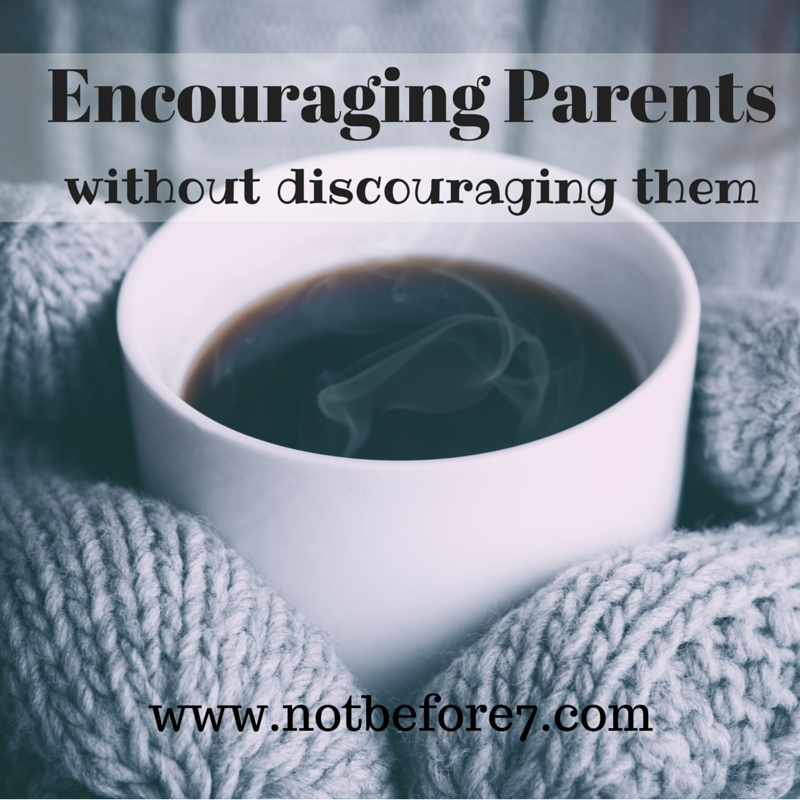 Encouragement in regards to parenting should be about the actions of the parent not about the actions of the child. It has taken me a bit of thought to sort out the difference between the two, but clarity smacked me in the head when I received two parenting compliments around the same time. One made me smile and the other left me feeling awkward. The first word of encouragement came from a friend who commented on the effort I put into planning an amazing Hunger Games themed weekend away with my oldest child. I accepted the compliment graciously. The truth was that it had taken a lot of work from the very moment I committed an entire weekend on our family calendar. I planned a bazillion details, made reservations at hotels, researched events, read books for discussion, purchased unique gifts and worked hard to make it a special time for my daughter and me. The efforts paid off and we had a blast. It was a “well done, Mommy” moment. I’ll take it. About two weeks prior to her encouraging words, my other daughter wrote a beautiful letter which was read by another close friend. The letter included her thoughts on God’s work in her life and her confidence in His promises. It was a beautiful display of her heart. But I was given a compliment after it was read: Wow. You are doing a great job, Momma! This time the compliment felt all wrong. Why? What was different this time? I gave it some thought. Now, I know my friend meant well. She was attempting to compliment me on the influence I have on my child, which is pretty strong in the younger years, but her comment seemed to reinforce this idea that my “good” parenting will produce the “good” kid in front of me. That somehow I deserve a pat on the back for my daughter’s good life. And I just don’t agree with that. What if my daughter rejects God one day? Will it be that my parenting was “bad”? Will I be labeled as a parenting fail? What if she moves in with her boyfriend before marriage? What if she chooses to wear completely inappropriate swimsuits? What if she betrays a best friend? What if she fails several courses in college? What if she becomes an addict? Do any of these outcomes make me a “fail” or a “bad mom”? They don’t. Parenting efforts should not be measured in regards to children’s actions. My daughter’s actions are HERS. I can influence them, particularly at these young ages, but in the end, I am not solely responsible for them. Complimenting ME for HER actions seems out of place. She is her own wonderful, unique person. If someone deserved a compliment about her letter, it was her! These two situations have made me very aware of the way I encourage fellow parents. I don’t want to reinforce the belief that getting parenting “right” will produce the behavior that you desire in your children. Period. Once I got the confusion sorted out in my own mind, I made some decisions. When I see a kid do something honorable, like share at the playground or defend someone to a bully, then I still intend to share it with their parent. Your child just did something great and I wanted to let you know so you can tell them how proud you are of them. We often report the negative, so why not report the positive? If it seems appropriate in the situation, I might compliment the child as well. If I am going to encourage a fellow parent, which I love to do as often as I can, then I am going to compliment their actions, not their child’s. I am going to focus on their efforts in parenting. It’s easy if you try. There are so many parents doing so many great things in their households. Find one and sincerely tell them what great parenting efforts you notice. This was so fantastic! Lately I have felt discouraged that I make effort as a mom my kids don’t always appreciate. I guess I need to stop letting their bad attitudes dictate whether my efforts were worth it! That is so true as well Melissa! We are responsible to be the best moms we know how. Somedays they are engaged iwth us and other days they aren’t. Awesome job Mary. I think that is totally spot on. EXACTLY!!! And I’ll tell you what. When someone compliments my son, the glowy pride I feel for HIM, as his mom, is better than if I were complimented. Its not because I’m taking credit! But because I love the sweet little person he is and I’m so happy someone else noticed too. Because a well placed compliment does so much more for his developing character and self esteem. And I’m grateful for that. Truly a word of wisdom. It’s like when someone compliments you on your child’s looks. Do I take credit for physical features? Of course not. I also don’t want to compliment a person on their looks. “You’re so pretty” makes them feel their worth is in their looks. When I do compliment a child about physical appearance I try to notice something they may not like, like their glasses or their freckles and make a positive comment on them. When my niece mentions your posts, I enjoy reading them. Back when I had little ones, this form of sharing wasn’t available. This generation can choose to use the internet as a place of sharing and blessing. Thank you so much for coming by and sharing your thoughts! There are so many great things for mommas on the internet and I am grateful for the support. This is such a wonderful post, as a mother I am aleays a little embarrassed when receiving compliments and I have learn to accept them latetly and to tap myself in the back every now and then . Love that post Mary . Parenting is such a roller coaster ride , some day feel like a total failure and some days feel fantastic , whatever the days , we ( moms) work so hard . And sometimes harder in the bad days .